For the peace of mind of a hygienic wash.
Every day you can come into contact with germs when in crowded environments, in public places or in the presence of pets. A regular detergent cleans but does not disinfect. 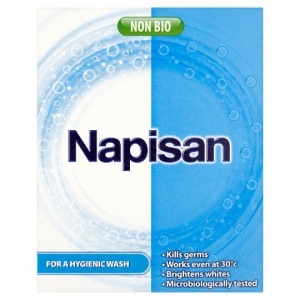 Napisan works by releasing active oxygen to remove stains. Items washed with Napisan will not only be clean but Napisan also kills the germs you can't see to leave your garments more hygienic. Irritating to eyes. Avoid contact with eyes. Wear eye/face protection. In case of contact with eyes, rinse immediately with plenty of water and seek medical advice. If swallowed seek medical advice immediately and show this container or label.